Atlantis Goodby!! Frank Garner, Stephen Ramsden, his frien Eric, and I got together to attempt to image the last chance for a solar transit of the ISS with the shuttle Atlantis from our area. A layer of “thin” clouds brought the “astronomical seeing” down to poor. Had to turn up the gamma and the gain way above my normal settings to get a reasonable shutterspeed for a transit image. Here my result. Not great, but good enough to say “Goodby to Atlantis”. 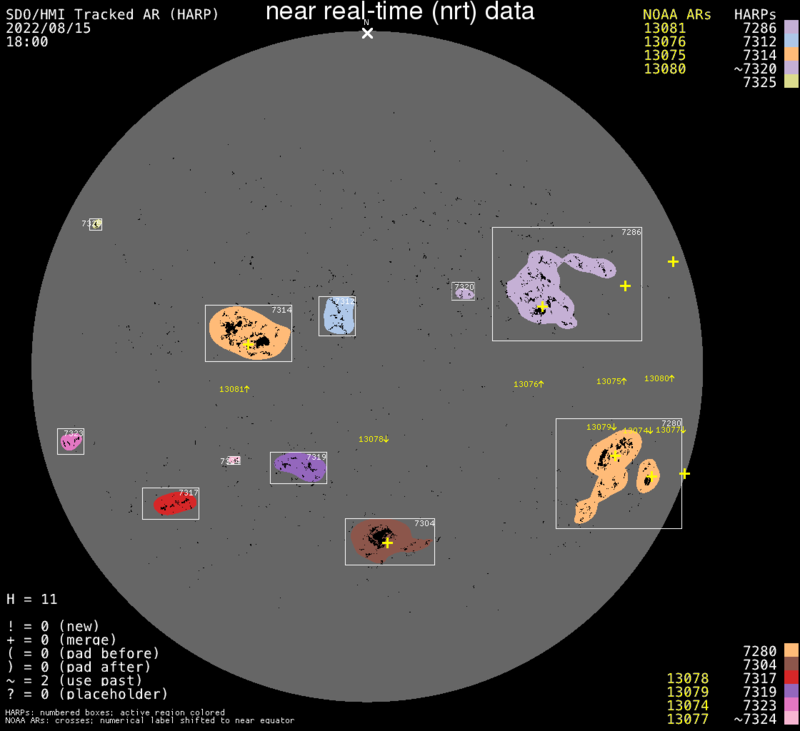 I’ve been eye balling the next ISS transit oportunity. A few weeks back there was a transit with Saturn, but clouds took care of that. We had a Lunar pass, but this one was 60 miles away, and it interfered with an outreach event. So today we have a transit with Jupiter , amost in dowtown Social Circle. 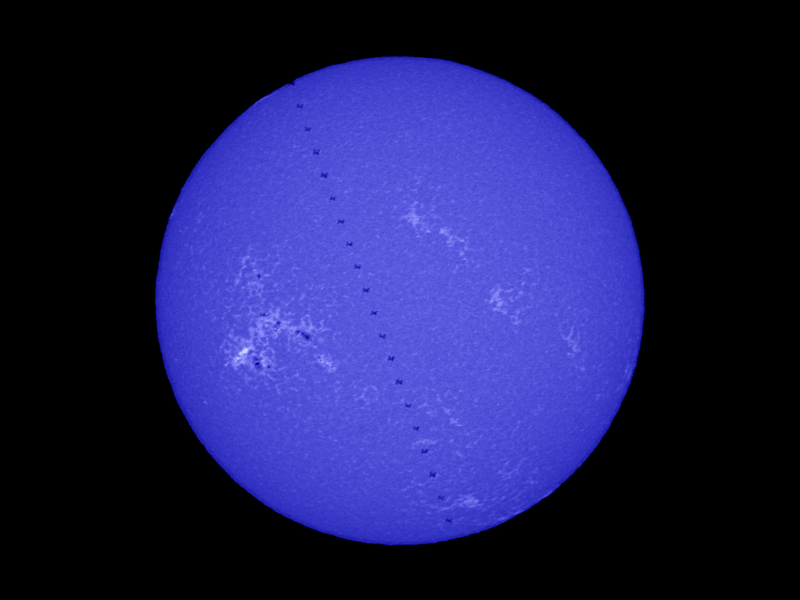 Pathwidth is only 330 feet and I believe the ISS at a brightness of Mag 2.4 would possibly be impossible to see in the glare of the sun. But…. not to worry about all that. Its cloudy anyway……..
A friend of mine made me aware of some images of me that were published in the Netherlands in “de Volkskrant”. This is a major national newspaper in the Netherlands. It is great that people all over the world get to see what we do here. It makes me fell good to be a little part of that outreach. Dank je wel Ria. No this is not the Moon, we have a two day full harvest moon. It is the cresent Venus as the ISS made a transit accross Venus from the driveway of a friend of mine. Frank Garner and I have been waiting a long time for this opportunity and we are very happy with this. Please note that this is a daytime pass at 4:38 P.M. local time and the sun is still 33 degrees high and 30 degrees from Venus. Venus was shining at a magnitude of -4.2 and the brightness of the ISS was -1.2, a difficult spread to manage in bright daylight. Today Frank and I tried for another ISS transit on the center line just at the other side of Hard Labor Creek Park. We missed the Moon transit earlier this week, because of a storm that came through an hour before. The sun was active with several sunspots, so we wanted to get these also in the image. The image sequence was started a minute before the transit and stopped 15 seconds after the transit completed. The transit accross the sun took 1.25 seconds. The ISS was at a distance of 696 km (435 miles). 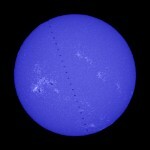 At 26.6 Arc Seconds, the diameter of the ISS was 1/72 of that of the sun. The images show also the active sunspots 1102, 1105 and 1109 at the Western limb of the sun. Frank Garner, Stephen Ramsden and I went last night to Charlie Elliott for another ISS/Shuttle session. I made two Clips. The first one while the duo was ascending, the second when it descended in the sky on the way to SSE. I stacked a few frames and sharpened them a little. Here two images of probably my last chance to image the final mission of STS132 Atlantis while docked on the ISS. Since the crew was woken up around 2:30 ET, the crew was asleep while these images were taken. Tonight, November 20th, was the third night in a row that I observed the ISS when it flew over our area. Jon Wood decided to go to CE and I joined him. I have tried several times to capture the ISS on previous flybys but never managed to get a close up. The star trail images were as close as I got….. until today. After many failed attempts, finally a closer image. Exposure is a problem because of the direct reflection of the sun on the Shuttle, but I am pretty happy with the result of this image of the Space Shuttle Endeavour docked on the ISS. Today is also the 10th aniversary of the International Space Station. And while I took this image, an EVA was in progress and spacewalkers Heide Stefanyshyn-Piper and Shane Kimbrough were working on the starboard solar alpha rotary joint. Click on the image below for a larger picture, or Click here for a short movie with all 31 images of the flyby. This image was taken on December 10, 2007 at 7:03 pm EST from the Dutch Observatory. Around 7:00 pm I received a call from Jon Wood. His wife Janet, spottet a large “spot” in the sky. We were all thinking of Holmes, but as we researched the event on the web, it became apparent that we were seeing the fuel dump of the upper stage of an Atlas Rocket who had positioned a spy satelite a few hours before and dumped the remaining fuel before re-entry. Thanks Janet and Jon Wood for the call so we could image this event! !